Are Converged Infrastructures (CI), Hyper-Converged Infrastructures (HCI), Cluster in Box or Cloud in Box (CiB) solutions for you? The answer is it depends on what your needs, requirements, application among other criteria are. In addition are you focused on a particular technology solution or architecture approach, or, looking for something that adapts to your needs? Join us in this discussion exploring your options for different scenario as we look beyond they hype including to next wave of hyper-scale converged along with applicable decision making criteria. 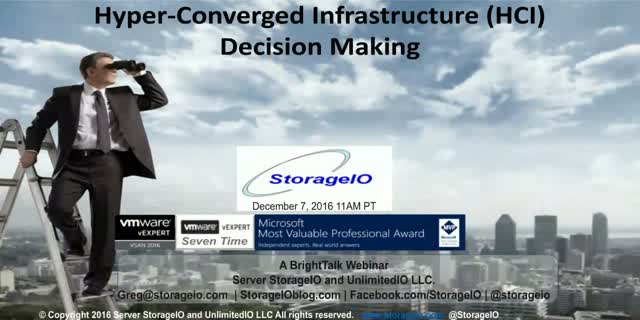 - What are you converging, hardware, hypervisors, management or something else? - Does HCI mean hyper-vendor-lock-in, if so, is that a bad thing?